Inspired by the work of the legendary Albert Eckhout (1610-1665), “Le Point D’eau” features a landscape of pure fantasy. Eckhout’s original paintings were extremely detailed studies of plants and animals found in the Dutch colonies during an expedition to South America. The resulting paintings were used by the artists at the Gobelins manufactory to produce Les Anciennes Indes (The Ancient Indies), which was a series of 8 tapestries. To increase the fantasy element, the artists introduced other animals into their landscapes, such as the horse in “Le Point D’eau”. These works were extremely popular in the 18th century and many can be found on display at the Getty Museum in Los Angeles. “Le Point D’eau” is a beautifully detailed and richly colored piece. 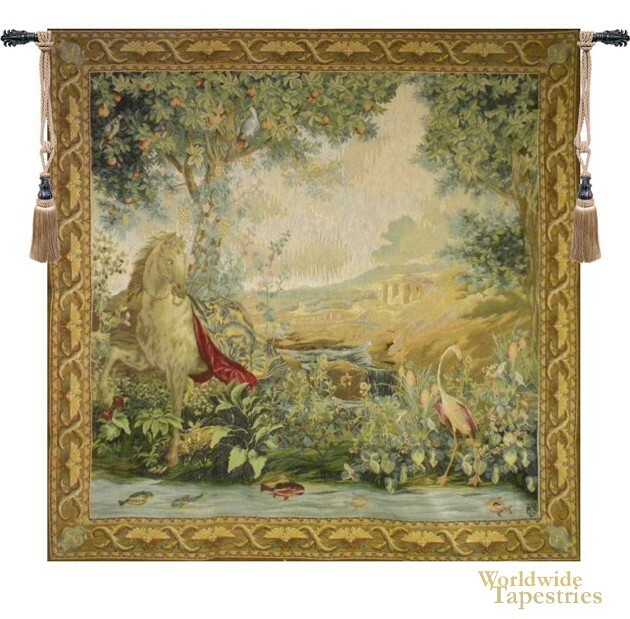 This tapestry is lined and has a tunnel for easy hanging. Note: tapestry rod and tassels, where pictured, are not included in the price.